Great Deal! Acer Liquid X1 Goes On Sale From 18K To 7.990 Pesos! Home / acer / mobile / news / Great Deal! Acer Liquid X1 Goes On Sale From 18K To 7.990 Pesos! Aside from the Liquid E700, Acer Philippines also announced that the Liquid X1 is currently on promo too. Coming from the original price of around 18K Pesos, the ageing yet still good flagship gets a massive price cut down to 6,990 Pesos. 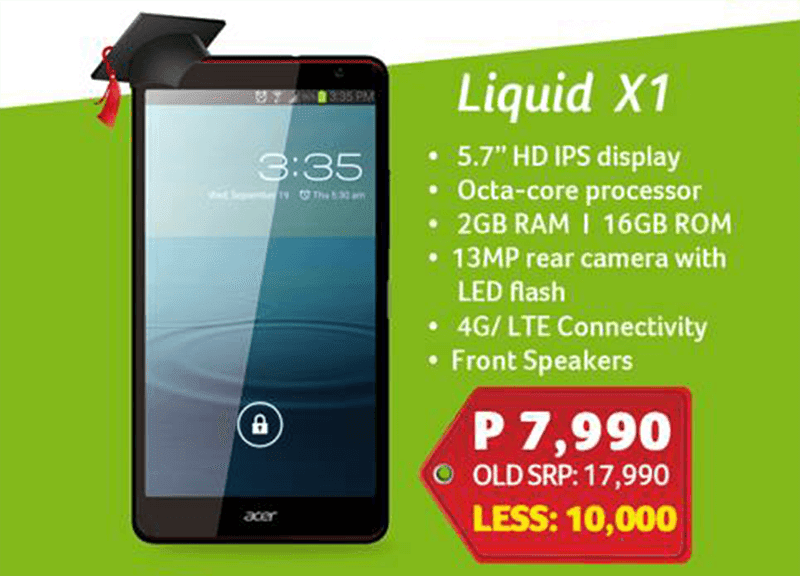 Acer Liquid X1 for 17,990 Pesos! The Liquid X1 is Acer's previous flagship that's impressive in its class. It features a dimpled texture at the back that adds more grip to its pretty big size. The X1 goes with a screen size of 5.7 inch, runs with 1.7 GHz MT6592 octa core processor, has 2 GB of RAM, 16 GB expandable ROM and 2,700 mAh of battery. Camera wise, it features a fast shooting 13 MP rear camera sensor and a 2 MP selfie shooter in front. It also has single SIM slot, LTE connectivity and runs on the older Android 4.4.2 Kitkat. Like we said earlier, even if this phone is ageing already, that 7,990 Pesos price tag is pretty tempting for a phone like this.